Burley Road Carpets Ltd is a leading retailer with a large selection of commercial and domestic flooring. We can offer a comprehensive choice of products along with expert knowledge allowing our customers to select the best flooring to suit their requirements and budget. As an established family business for over 25 years husband and wife team Mark and Andrea can offer a wealth of advice and expertise on many products followed up by a quality installation service from our own professional dedicated fitters. Our reputation has been built by consistently delivering the best products and services available to our customers. We take pride in our reputation and are constantly striving to maintain and improve on it, by ensuring that we only deliver outstanding quality products and excellent customer care at competitive prices. New business is regularly gained through recommendations from existing and happy customers and we take these recommendations as a testament to our flooring, workmanship and customer care. 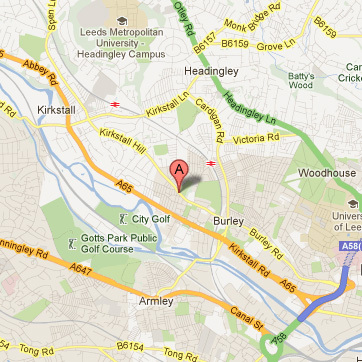 Please feel free to contact us with any questions or comments through our website at info@burleyroadcarpets.com, alternatively pop in to see us on Burley Road, Leeds. We’re located at the pin on the map below. For our upto date opening hours please call us on the shop number 0113 2742122 or mobile 07724 503422 Andrea/07834 346541 Mark.